The pioneering Hepburn Wind farm will open its gates for a family-friendly festival of art, music and food on Saturday 15 November. (Extra information in the web flyer at bottom if this post). 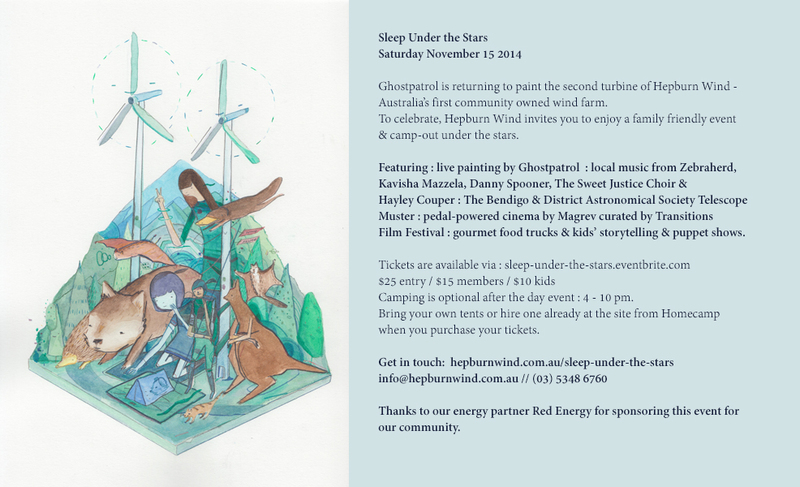 Sleep Under The Stars is a celebration of renewable energy featuring the painting of Gusto (one of Hepburn Wind’s two turbines) by Ghostpatrol, star-gazing with astronomers, gourmet food trucks, live music from emerging artists, pedal powered cinema and more activities for the whole family. “Hepburn Wind members, locals, wind farm fans and art fans alike will gather to enjoy a sensory evening of art, entertainment and clean energy,” said Taryn Lane, Community Officer of Hepburn Wind. The centrepiece of the event will be the completion of a 17 metre tall mural by internationally-renowned street artist, Ghostpatrol. After their widely acclaimed 2013 mural on the turbine known as Gale, artists Ghostpatrol, Bonsai and team are returning to paint Gusto. The mural was made possible after a successful crowdfunding campaign raised over $10,000 from more than 75 wind farm and art fans. 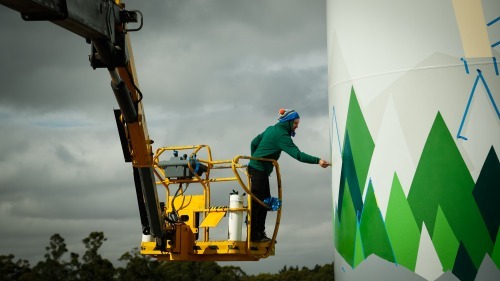 Ghostpatrol, Bonsai and team will begin painting at the wind farm from Saturday 8 November. Final touches of the mural will be unveiled at Sleep Under The Stars. Visitors are welcome to attend for the evening and optionally stay in either their own tent or hire a luxury camping tent. Hepburn Wind has been recognised with awards such as the Premier’s Sustainability Award, the Banksia Award and the World Wind Energy Award for its unique approach to community engagement. Sleep Under the Stars is sponsored by Red Energy, which purchases the clean energy produced by Hepburn Wind and has created a shared product called the Community Saver that directly benefits the local community. Local music by Zebraherd, Kavisha Mazzela, Danny Spooner, the Sweet Justice Choir, and Hayley Couper. I’m standing for the Australian Cyclists Party in the Upper House/Legislative Council Northern Region, and naturally, we support renewable energy. Fossil-fuelled motorized transport is a necessary evil, but less necessary and more evil without renewables powering good public and necessary, rather than discretionary private transport. Renewables should be available for any community that wants to invest in them and in a managed and consensual way as a commercial venture. Previous Previous post: Election Watch: Will Labor lead on renewables? 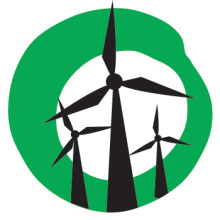 Next Next post: Election Watch: Can Napthine be trusted on renewable energy?